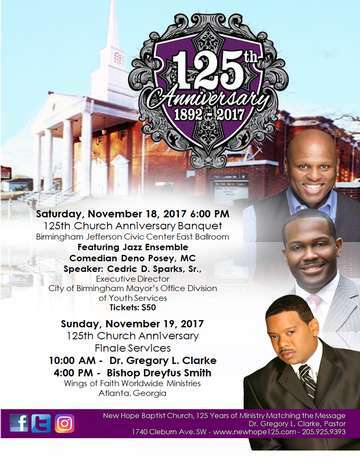 You are cordially invited to join as we present our 125th Church Anniversary Banquet to be held on Saturday, November 18 at 6:00 p.m. at the Birmingham Jefferson Civic Center East Ballroom. Comedian Deno Posey will serve as Toastmaster. Music will be rendered by Smooth Blend & Company. Our guest speaker is Cedric Sparks, Sr., Executive Director, City of Birmingham Mayor's Office, Division of Youth Services. Tickets are $50. Tables can be purchased at $400 for seating for (8). Attire is Formal & Semi-Formal.